Are you seeking a meaningful volunteer experience in one of the liveliest and most intoxicating countries in the world? Volunteer in China, and have the opportunity to experience the land of mystery and one of the world’s oldest civilizations while contributing to society. China is the meeting of the Yin and Yang; the old and the new, the industrial technology and the traditional culture, the rich and the poor. China may be a country with a booming economy, but it still has a great percentage of people who need assistance. 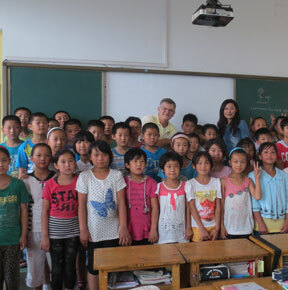 Be a volunteer in China and help those who get left behind in the pursuit of intense development. Teach English and spread the power of knowledge and education to impoverished children at rural areas and help at orphanages which almost always lack resources and manpower. Are you an animal lover? The growing massive population in China meant that the habitats of Giant Pandas will only shrink further. Assist in our Panda Conservation program and care for the majestic animal which is now facing endangerment. The volunteering programs in China fees will cover expenses that will begin on the first day of the program (usually the first or third Monday of the month) to the last day of the program. If you arrive before the first day of the program or you decide you stay beyond your program’s last day, you will be responsible for the additional expenses. New Hope Volunteer will arrange for the accommodations and 3 meals a day throughout the duration of your volunteer in China program. If you are a vegetarian, please note it as such in the application form so that we can make arrangements for you ahead of time. Most volunteers will stay in our home base during your volunteer period, or with a host family when the home base is full. In the Panda Conservation program, volunteers will stay in a hostel. Our home base is a secure place for our volunteers to stay in a safe neighborhood. There is a shared kitchen and shared bathrooms, which have running water and western-style toilets and sometimes room-shares. Internet cafes, shops and restaurants are very close by to our home base facility. Our host families have been carefully screened before being selected to participate in New Hope’s volunteer programs. All of our host families have significant experience accommodating international volunteers. Your hosts will provide you with a warm, comfortable and secure place to stay. You will have a room to yourself and eat 3 local meals together with your host family. Staying with a host family is an excellent language and culture immersion experience. Rest assured that at least one member of the family will be able to communicate with you in English. During the volunteer program, our in-country coordinator will be in touch with you every 10-15 days to make sure you’re comfortable and happy. Volunteers will also have access to a coordinator’s mobile phone to call for assistance should any problem arise. The hostel in Chengdu is located very close to the panda conservation program in a safe neighborhood. It has bathrooms, running water and western-style toilets. There are many layers of support available to you while volunteering in China. You will have your in-country coordinator’s mobile number should you need any assistance. You will meet our project staff daily during your volunteer work in China and staff workers will be available in and around New Hope’s home base and hostel to help guide you.